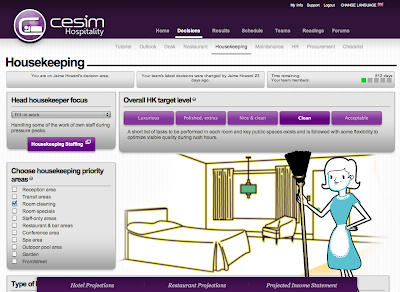 Guest Post by Zsuzsa Jakab - Business Development Manager at Cesim Oy. Have you ever tried explaining complex business concepts to your students? If so, you'll know that it's difficult because many of the real life nuances of business decision making get lost in the process. So what do you do? Many people have found success by using active learning tools like business simulations However, there are a few things you should know before you buy and implement a business simulation to ensure that it’s a roaring success in your class (please find also CNN Today On How Serious Games Can Make You Smarter). 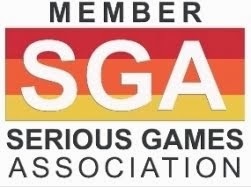 This post will tell you three things; (1) what are Business Serious Games , (2) what you need to know to make sure you select the right solution that will let you successfully illuminate various business concepts to your students, and (3) what are some Business Serious Games for specific disciplines that you can use. 1. 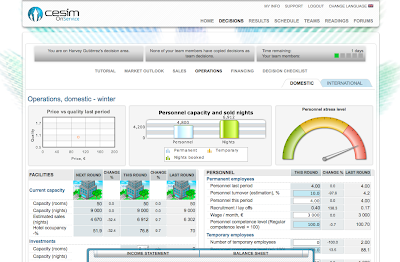 What are business simulations? Business simulations are active learning tools devised to create a controlled and risk-free economic environment in which participants can practice strategic business decision-making. As a consequence of the simulation game, students will understand the impact of their actions and the interconnectedness of various functional areas within a company. Increasingly business simulations come in an accessible browser-based form that makes them easy to incorporate into either a blended or completely online learning format. 2. How to select the right learning tool for your course? · Make sure your chosen tool is completely browser-based. If it isn't, you'll have trouble running it effortlessly in some formats that incorporate online distant learning. 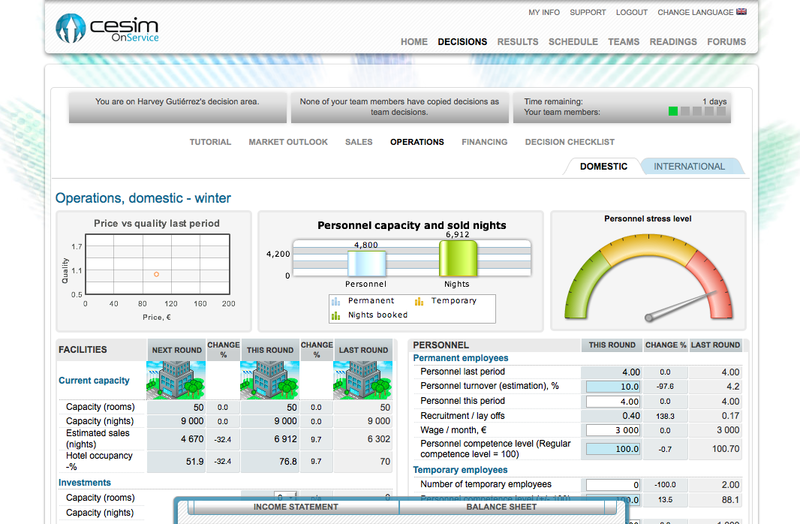 · Ensure your business simulation has a comprehensive student guide so you can concentrate on educating instead of explaining the rules of the game. · Any good business simulation should let you set the course schedule and share additional learning materials with your students. This is important because it provides the flexibility to tailor the simulation game to your exact needs. · More specifically, the business simulation should reflect the concepts and theories you'd like to give a practical expression to in your course. · Finally, it is important to confirm that the business simulation generates accurate and detailed results, so you can grade your students based on a variety of factors if you wish. simulation are scalability, customizability, and compatibility. 3. What are some business simulations for certain disciplines? The rapid development of education technology coupled with the increase in need for more and more sophisticated learning tools led to the proliferation of Business Serious Games as well. Now there are models for a great number of business disciplines, including international business and strategy, marketing, supply chain management, hospitality management, and more. Cesim Global Challenge has been designed to improve student understanding of the complexity of global business operations in a dynamic, competitive environment. It's used in strategy and international business courses at graduate and advanced undergraduate levels, executive MBA programs and capstone courses. Key learning areas: Technology-based product road maps and global market and production strategies. A range of concepts from various management-related disciplines: economic, political, financial, human resources, accounting, procurement, production, logistics, research and innovation, and marketing. Cesim On Service business simulation is designed to teach all essential elements of running a small services business. It's used in entrepreneurship courses at various levels, college preparedness courses, undergraduate courses focused on core business processes, advanced business courses at the secondary education level. Key learning areas: Management of the overall operating, market, and financial performance, with human resources management, capacity management, investments, service quality, pricing, and marketing as the key decision making areas. 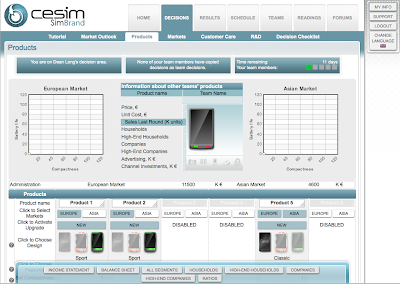 Cesim SimBrand develops student understanding and command of the whole marketing decision-making process. It's used in marketing management courses at any level. Key learning areas: The simulation covers marketing topics including segmentation, positioning, distribution channel investments, advertising budget allocation, after sales services, pricing, sales forecasting, marketing research, competitor analysis, research and development, and profitability. 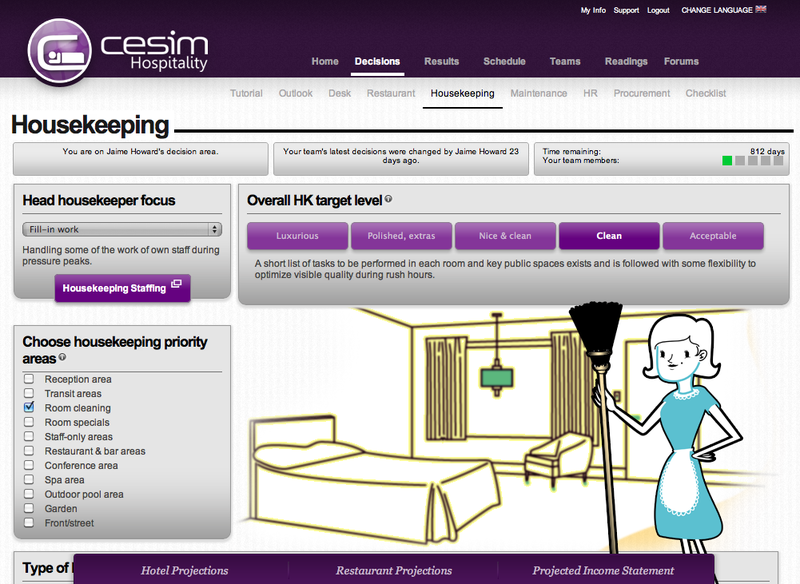 Cesim Hospitality is an interactive hospitality simulation game, which focuses on running a hotel and a hotel restaurant. It's used in business and management courses at undergraduate and graduate levels in hospitality and tourism programs. Key learning areas: Hotel management related functions; revenue management, sales promotion, menu engineering, housekeeping, staff management and procurement. Big picture understanding of the linkages between different functions and their impact on the bottom line. 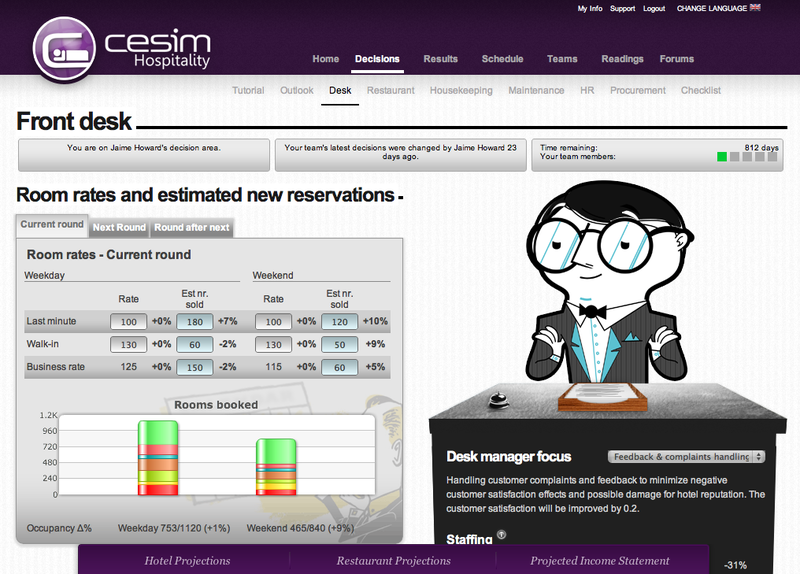 Claim your trial instructor account and a live walkthrough of Cesim Business Simulations here: www.cesim.com/sign-up-for-a-demo. 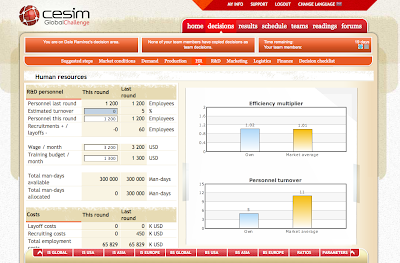 Cesim Business Management Simulation Games help educators improve the decision-making skills, business competence, and overall employability of participants by engaging them in an interactive and fun online learning environment. Cesim’s Chairman and Founder, Ilkka Vesterinen, established the company to provide intellectual challenges for individual business skills. After playing business games as a hobby and founding them to be so rewarding, his purpose was to enable others with practicing and deeper understanding in an efficient, motivating and fun way. They match or develop a Business Serious Game to the learning goals – which in turn gives them the challenges and the motivation that they feel proud of. Innovative Simulation Games that run themselves without administration and technical limits for tens of thousands of users in all the continents was their dream when they started. 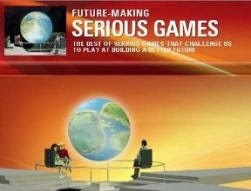 Today they are looking for new ways to exceed themselves in the fascinating world of Serious Games. Zsuzsa Jakab, has over 5 years of experience from various fields such as mobile technologies, game design and digital marketing (both on the production and project management side). Prior to joining Cesim, she was a project manager at the Finnish marketing agency FWD Helsinki, where she had successfully led a creative team of digital marketing professionals to deliver projects to clients such as Sonera and Global Champions Tour. She has joined Cesim, because she deeply believes in the educational value of their innovative learning solutions, and as a business student herself, she derived great value from the hands-on practice that such tools provide.